That’s my best textual attempt at the Dr. Who theme song. If you’ve ever heard it, you’d get it. For a while there, the only BBC programs I watched were products of its natural history division, generally featuring David Attenborough (sorry Sigourney Weaver, Sir Attenborough is still my favorite Planet Earth narrator… I mean, even the word “grass” sounds so much more magnificent when spoken with his accent! Grahwwwss. /prostrate). Brian and I also enjoyed BBC Scotland’s quirky comedy-drama, Monarch of the Glen, with its memorable cast of whiskey-loving curmudgeons, nobly tormented lairds and ghillies, and sassy lasses, not to mention the eye-popping, up-country scenery. But never mind that. Recently, it’s all about the new Dr. Who episodes (made since 2005). 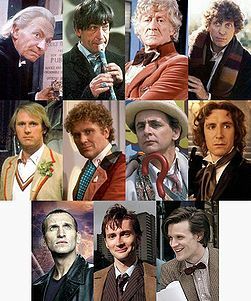 Growing up, I used to watch the old series with my brother, so I knew Tom Baker as the poofy-haired, scarf-wearing Doctor long before I encountered him again as Donald MacDonald in Monarch. I remember with fondness the corny production values of the original series, so I was delighted to see the same Time Lord enemies reappear in all their low-budget glory in the new seasons. Daleks still look like they ripped the lightbulbs off some aging starlet’s dressing-room mirror, and it’s still hard to take them seriously as they threaten heads of state with what look like toilet plungers and egg beaters. The new shows from BBC Wales are overall much glossier and more professionally stylized, but I’m glad they still retain something of the original’s campiness. I got hooked into watching after stumbling across some episodes from Season 4, featuring David Tennant as the Doctor and Catherine Tate as Donna Noble, the Doctor’s sidekick. I was especially impressed with “Midnight,” and the two-parter beginning with “Silence in the Library,” and I resolved to go back to Season One of the new series, though this meant tolerating a season of Christopher Eccleston as the Doctor (okay, he grew on me a little…) and learning to appreciate the dewy-eyed, pouty-lipped but ultimately endearing bravado of Billie Piper as Rose Tyler. 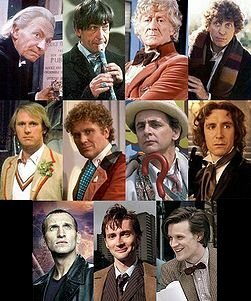 The most recent Doctor seems to be a throwback to the celery-wearing Doctor of seasons past, but I’ll give him the benefit of the doubt, because the series just makes me happy!